After assembling slip cases, Techni-Pak collated and inserted multiple titles into each case. 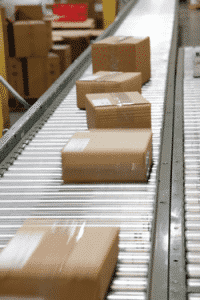 The entire slip case was shrink-wrapped on a high speed, automated machine with high quality 75-gauge film. After the product was shrink-wrapped additional automation was used to print and apply a retail sticker and a UPC bar code to the package. Finally, the product was placed in cartons, labeled, palletized and distributed per customer specifications. After the initial on-time shipment, Techni-Pak continues to warehouse product for future orders. Given the size (over 300k units) and holiday nature of this promotion, the turnaround times required for this project were very tight. Techni-Pak was able to beat deadlines while still maintaining the quality necessary to have no rejects or returns. The project was successful for both the customer and the end-customer and as a result will be completed again next year. Our customer supplied peanut brittle for a national retailer’s private label holiday promotion. Several truckloads of bulk food were sent to Techni-Pak for final packaging in the FDA-certified portion of its facility. After weigh-scaling the right amount of product per customer specifications, Techni-Pak filled each clamshell container. After clamshell was sealed, product labels with product and nutritional information were applied to the package in exact location. The food packages were then placed in cartons, palletized and distributed directly to the end-customer’s distribution centers. The customer did not have the in-house manpower or expertise to effectively manage the growing returns process. Turning to Techni-Pak has allowed the customer to focus on its core competencies and save money not only by capitalizing on Techni-Pak’s superior efficiencies but by also increasing the successful recycled rate of the educational tool. The customer sells and markets a proprietary electronic educational tool. As the product’s usage has grown, so have the logistics involved in managing the returns of used units. The company turned to Techni-Pak to manage this process. Techni-Pak receives large quantities of used units and tests each individual unit. They are then sorted into three groups: fully operable, salvageable or not salvageable. Techni-Pak cleans, refurbishes and reprograms the operable and salvageable units and returns them to the customer to be redeployed. Originally, the customer was unsure that they would be able to take this project on. After consulting with Techni-Pak, they went ahead with it. Despite the complexity, the project was completed without a single error and Techni-Pak’s customer won high marks from its customer for successfully completing this on time and cost effectively. Techni-Pak was sent over 40 unique components from a variety of vendors. The promotional products included items such as t-shirts, posters, cups, floor mats and various office supplies. The customer needed Techni-Pak to assemble several hundred master kits that would each be sent to individual high schools across the country. The challenging part of this project was that each master kit not only consisted of several sub-kits, but each master kit was unique based upon each school’s own preferences. Techni-Pak staged and organized all the promotional products and first built the sub components; once complete, master kits were assembled, placed in cartons and distributed to each high school.